November 22, 2018 – David Michael Metcalf passed away on October 25, 2018. He is deemed one of the world’s most renowned numismatists. He was one of the first to reconstruct medieval money circulation by means of statistics. The abundance of awards and recognitions he received for his work proves how significant his achievements were for numismatics: in 1983, he was honored with the British Numismatic Society’s John Sandford Saltus Gold Medal; in 1987, he was granted the Medal of the Royal Numismatic Society; in 1991, he received the Huntington Medal of the ANS; in 2008, the Israel Museum presented him with the Meshorer Numismatic Prize; and in 2008, he received the British Academy’s Derek Allen Prize. We have lost a researcher, a teacher, a museum curator, and – last but not least – a coin collector who had a lasting influence on the field of numismatics. Michael Metcalf in retirement in the Yorkshire dales. We thank Nick Mayhew who kindly sent us the photo. Michael Metcalf was born on May 8, 1933. He was the son of a Methodist cleric and as his father was transferred from pastorate to pastorate, the family constantly moved all across Great Britain. Hence, Michael was born in Newcastle, but grew up in Keighley / West Yorkshire. He was a fervent coin collector from an early age on, but he nevertheless decided to pursue a degree in Geography. Perhaps that is the reason why Michael Metcalf – under the guidance of Philip Grierson, who taught at Cambridge at the time – developed an approach to interpreting medieval coins which was considered spectacularly new and refreshing by the standards of the time. His impressive language aptitude – allegedly, he once told a young colleague of his that, with a dictionary in hand, he could master just about every European language, except Hungarian – allowed him to expand his interests to other countries. In his dissertation, which was published in 1965, he analyzed the coinage of the Balkans between 820 and 1355. His first major work already was so important for numismatics that it was reedited and republished in 1970 and 2016. Michael Metcalf began working at the Ashmolean Museum in Oxford in 1963. In 1982, he accepted the position of director at the Heberden Coin Rooms, which he held until he retired in 1998. At the same time, he was named a Wolfson College Fellow and its “Keeper of the Department”. In 1996, he was appointed the first Professor of Numismatics at Oxford University. This was a well-deserved honor, seeing as Michael Metcalf had developed revolutionary theories on the monetization of England in early medieval times as a young student already. On the basis of a detailed die study on the coinage of King Offa, he proved that the original number of coins minted must have been much higher than the few finds known at the time had suggested. This thesis caused quite a stir. In his excellent and detailed obituary on Metcalf published in The Guardian, Nick Mayhew mentions a debate that was held at Oxford University in 1966. It escalated so drastically that even the national press reported on it. You can only appreciate Metcalf’s accomplishments properly if you keep in mind that in the 1960s, he did not yet have access to the vast hoard finds which were discovered in the 1980s due to the use of metal detectors! Michael Metcalf’s books and papers have had a lasting influence on our understanding of the economy of the early Middle Ages. By expanding his analysis across the national borders, he discovered, for example, that the coins of the Netherlands closely resembled English coinage. This was considered proof that, due to British wool imports, the two countries were maintaining close trade relationships in the Early Middle Ages already. 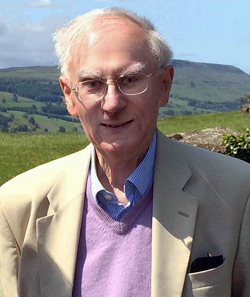 Michael Metcalf leaves the numismatic community a legacy captured in numerous books and papers – Nick Mayhew has counted at least 23 books and 250 scientific articles. Between 1994 and 1999, Metcalf worked as the President of the Royal Numismatic Society and he was the head of the editorial team at the Numismatic Chronicle between 1974 and 1984. We mourn the passing of an outstanding numismatist, who did not shy away from subject-specific controversies despite his affable personality. We extend our most sincere condolences to his three children and six grandchildren. We will miss Michael Metcalf dearly. Nick Mayhew’s obituary for Michael Metcalf was published in The Guardian. The Yorkshire Numismatic Society has also published an obituary. The Digital Library Numis offers a great number of Metcalf’s articles, which will give you an idea of his research. If you want to learn more about the history of the Heberden Coin Rooms please read the article written by C. M. Kraay and C. H. V. Sutherland.